Boardwalks have been used successfully for many years to facilitate walking across sandy coastal areas and they continue to be the best choice for some settings. 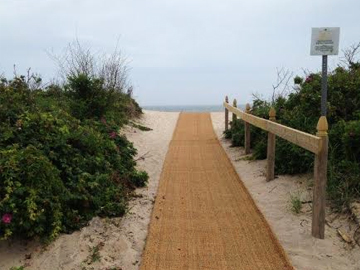 Recently however, NETCO has engineered an alternative to boardwalks—coir Beach Mats. NETCO’s Beach Mats are made of coir (coconut fiber) that is woven into heavy duty “fabric,” then layered to make mats. 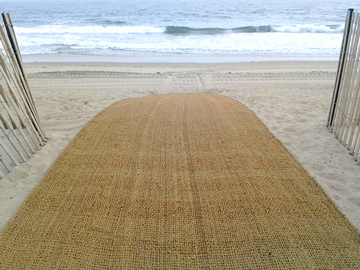 The Beach Mats are then anchored deeply into the beach, dune, or coastal bank to hold them in place. 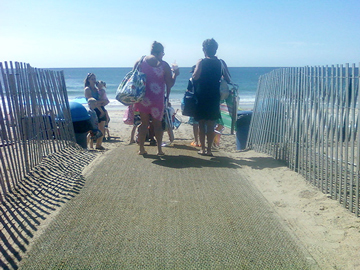 Beach Mats come in many sizes and can be installed in almost any place that boardwalks would be used, including dune cross overs and other beach access ways. The Mats stay cooler in the summer sun than boardwalks and are easy to walk on and to pull wheeled carts/wagons across. They reduce erosion by keeping sand in place. They are less expensive than boardwalks. They are easier to repair than boardwalks. They can be removed at end of the season or in the event of a pending coastal storm. They are flexible for use in uneven terrain. They don’t inhibit growth of beach grass that could seed in the openings.